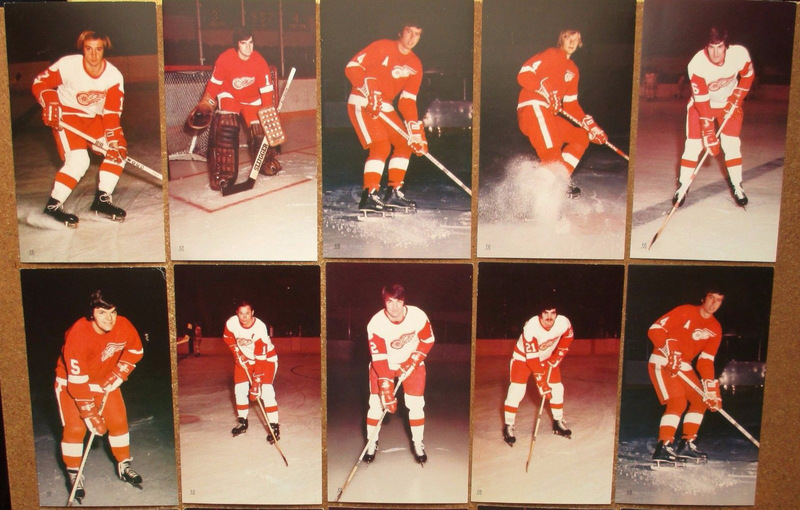 If you traveled back to 1974 with a couple of $20 bills, you could get a lot of great Detroit Red Wings merchandise for a pretty good price. 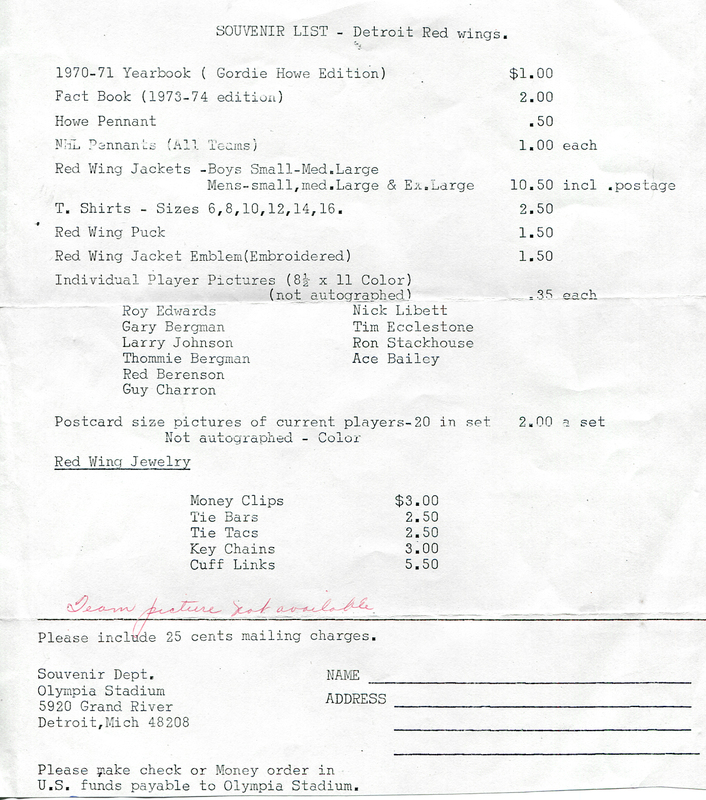 A while ago, I came across this list of Detroit Red Wings souvenir items that were available directly from the team via mail order during the 1973-74 season. Here are some of the more notable items from the list. I’ve included what the price would be in 2018 dollars (in parenthesis), according to the United States Department of Labor Bureau of Labor Statistics website, which has a nifty inflation calculator. 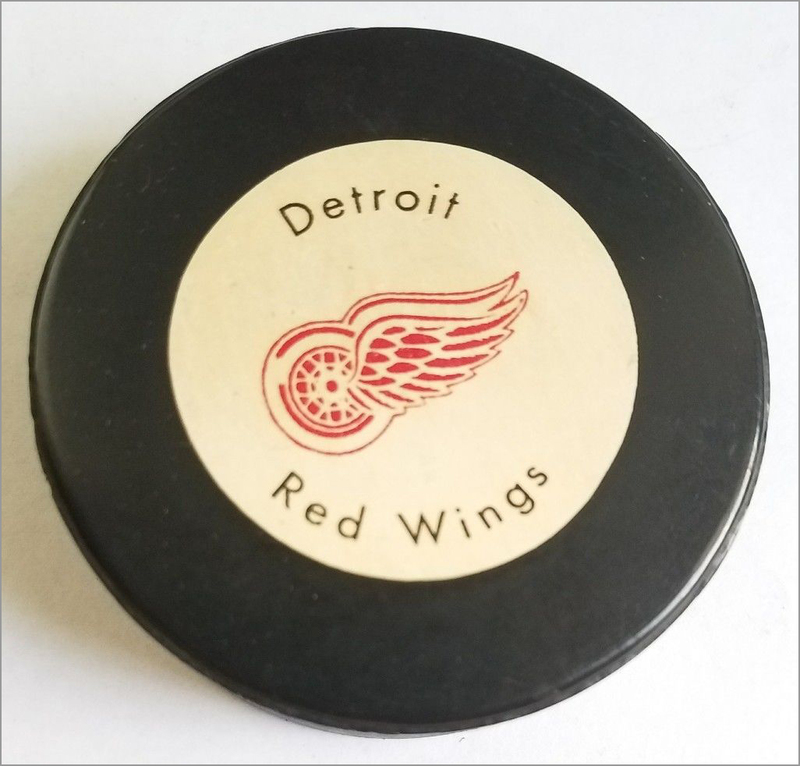 Red Wings puck for $1.50 ($7.98). That seems overpriced, but on-par with what stadiums usually sell pucks for. I think I paid $10 for a puck last time I bought one at a hockey game. 20-card team postcard set for $2.00 ($10.64). Postcards nowadays usually sell for $1 each, so $10-and-change for 20 postcards is a steal. 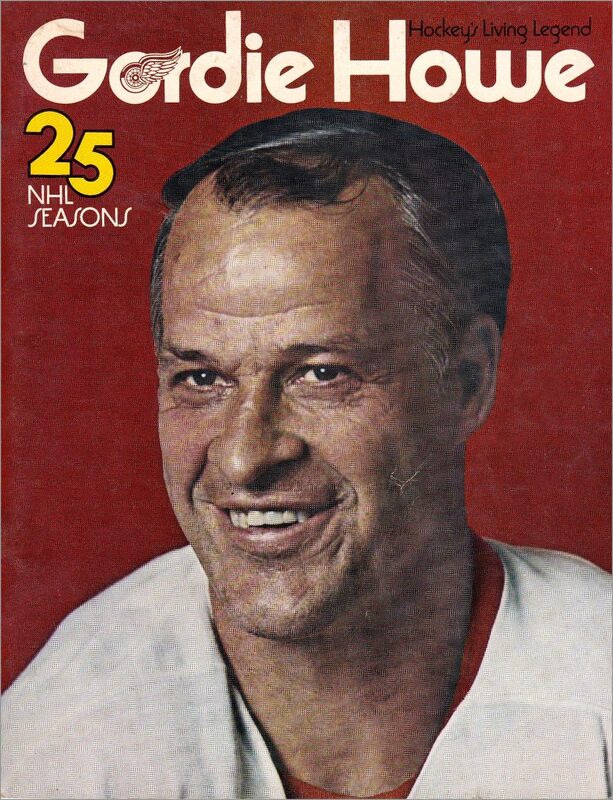 1970-71 Red Wings Yearbook (Gordie Howe Edition) for $1.00 ($5.32). Team yearbooks sell for at least $5, but probably closer to $10, so this price is right. Note that Howe had retired after 1970-71, and yet in 1973-74 they were still selling the team yearbook from his last season. 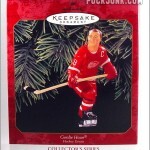 Gordie Howe pennant for 50 cents ($2.66) and NHL team pennants for $1.00 each ($5.32). 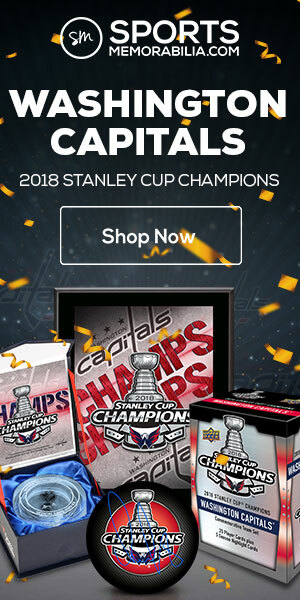 The price list does not say how big these pennants are, but based on the price, I assume that the NHL team pennants are probably the typical size, while the Howe pennant is probably smaller. Red Wings jacket for $10.50 ($55.85). Now this might be the best deal by today’s standards. Go ahead and find a licensed team jacket — of any team from any sport — for under $60. You can’t. I also can’t find a picture of what this jacket looked like, but for under $11, I’d buy one sight unseen (much like Wings fans did in 1974). Red Wings Jacket Emblem (Embroidered) for $1.50 ($7.98). 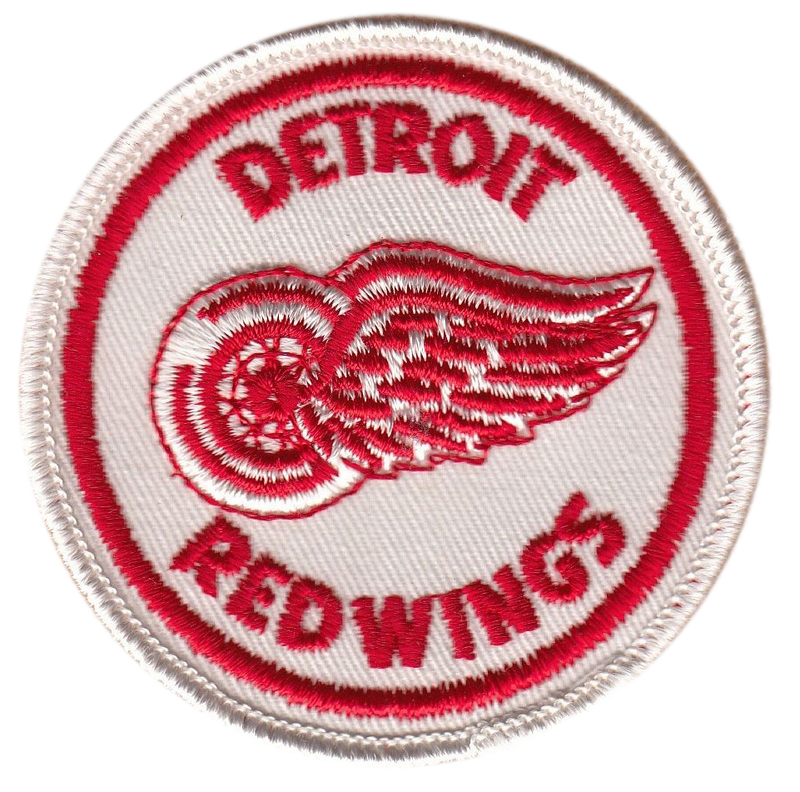 If you couldn’t afford a Red Wings jacket, you could just buy a patch instead and make one yourself. The price list came in this envelope, which was postmarked on January 18, 1974. Note that the return address is the Olympia Stadium, which was the stadium the Red Wings played at until 1980. I purchased this price list and envelope, along with other miscellaneous paper items, from a seller on Ebay. 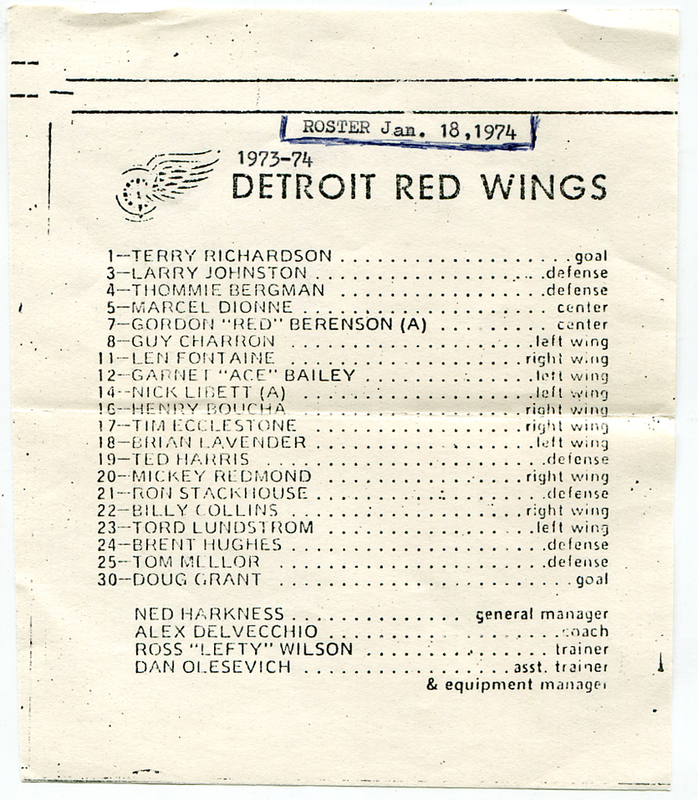 He also included this Red Wings team roster, dated January 18, 1974. I’m not sure if this roster was sent to along with the price list, but it probably was, as both were folded to fit in the envelope. 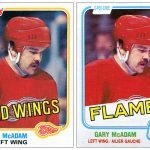 Not the most intimidating Red Wings lineup. 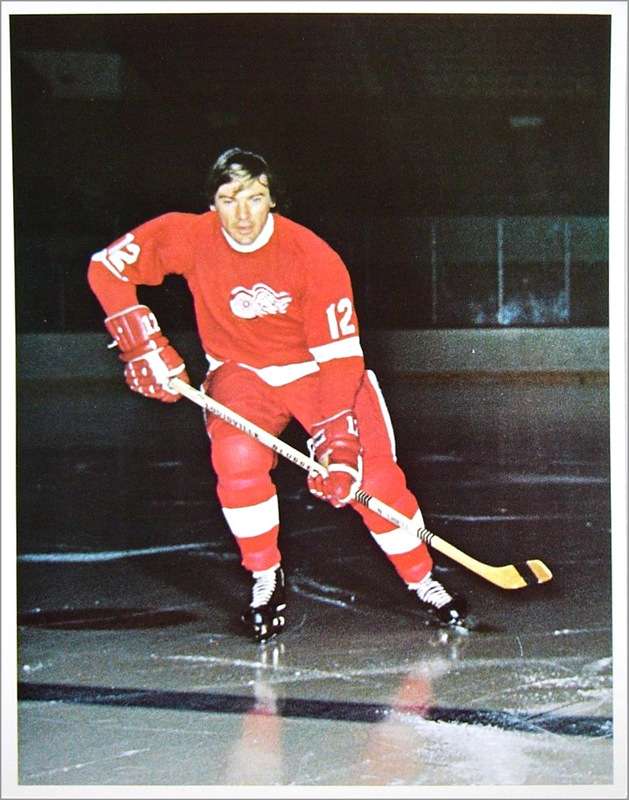 Sure, Detroit had Alex Delvecchio — but he was the coach. 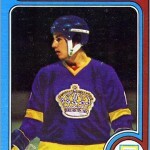 Goaltending duties were handled by Doug Grant and Terry Richardson, who I never even heard of until I saw this roster. 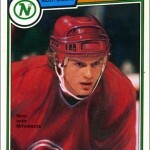 Also on the ‘Wings that year was Marcel Dionne, before he’d get traded to the Kings and become a future Hall of Famer. I’d buy the photo cards for sure, both the 8×10 and postcard size…they are just big trading cards to me. Probably the embroidered patch and yearbooks, too. 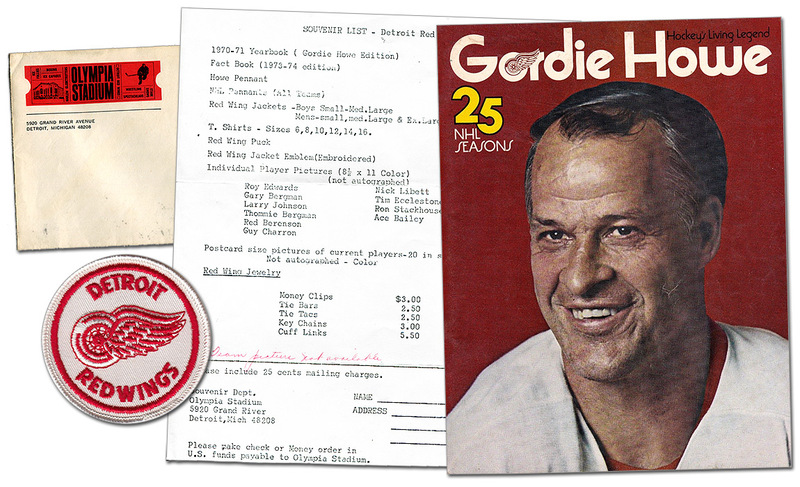 If you could go back in time with $20, what Red Wings items would you purchase from this souvenir list? 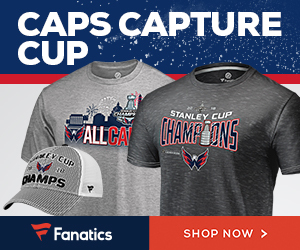 I’d purchase a few t-shirts, postcards, and a money clip. Do people nowadays still use money clips? I’d also tell Garnet Bailey to avoid all airplanes on 9/11/01. RIP Ace.